The Biodiversity, Forests, Fisheries and Food Security Working Group works with the Bureau for Food Security, the Africa Bureau and the Center for International Forestry Research (CIFOR) on key questions related to biodiversity and food security—such as the importance and role of wild fisheries, the role of forests and the protection of pollinators. 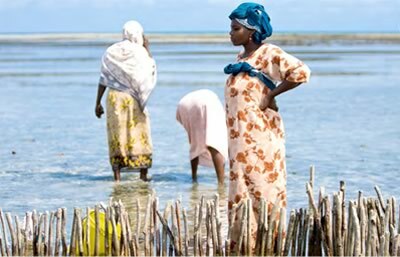 Women Collecting Cockles in Bweleo Village, Zanzibar. Photo by Klaus Hartung. Despite tremendous gains in food production over the past 40 years, currently 795 million people do not have enough food to lead healthy, productive lives. That is about one in nine people on earth, according to the World Food Programme. Food security involves many sectors and strategic approaches. Fisheries, forest products and other non-agricultural resources are critical to food security, contributing protein and micronutrients as well as income to buy food. The group's work complements Feed the Future, the U.S. Government’s global hunger and food security initiative, which focuses on improving productivity, markets and nutrition. Biodiversity underpins the ecosystem goods and services that enable sustainable development. At the American Public Health Association Annual Meeting in 2016, Dr. Anila Jacob of the USAID Biodiversity Results and Integrated Development Gains Enhanced (BRIDGE) project shared research linking biodiverse natural systems with food security and nutritional outcomes. Dr. Jacob’s findings reveal how wild foods and other contributions from healthy ecosystems—such as pollination and natural pest control—enhance food security. “This evidence further signals the importance of conserving biodiversity and integrating it with other development sectors in order to achieve long term goals,” Jacob said. Fish, and fisheries, are critical to food security. But what action is needed? Improved protection and management of the earth’s natural environment is vital. When humans meet food security and nutritional needs through ecologically sound approaches, development objectives, such as broad-based economic growth, improved governance and climate change adaptations, are also enhanced. Identifying and supporting these synergies is at the core of the BRIDGE project's mission, aligning with both the USAID Biodiversity Policy and the new USAID Global Food Security Act. Forests and Food Security: What’s Gender Got to Do with It? Wild fisheries were highlighted in a recent Ag Sector Council Seminar hosted by Agrilinks.